Spring break is one of the best times of the school year. This week-long break brings people to the fun and sun all over the world. 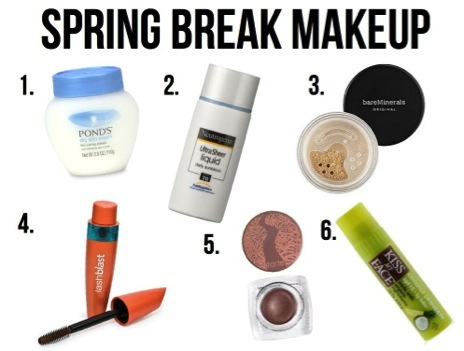 But whether you’re tanning in Cabo or just headed to the beach, the right makeup can help you look your best while you’re having fun! Moisturizer: Staying in the sun for a few days can really dry out skin. Bring a moisturizer that will keep the skin hydrated throughout the day. Pond’s Dry Skin Cream ($8) works for all skin types and is incredibly affordable! Sunscreen: This product is the one that you definitely won’t want to leave home without. Look for a high SPF that will protect you from the harmful UVA and UVB rays. Neutrogena’s Ultra Sheer Liquid Sunblock SPF 70 ($12) layers flawlessly under any makeup and the high SPF helps protect the face from sun damage. Powder Foundation: Caking on makeup isn’t the best idea when headed to the pool or beach because the extra moisture from the hot temperatures and swimming can cause the foundation to run, which isn’t key for picking up cuties. Look for a mineral foundation that is matte which will help keep oil and sweat from showing through. Try Bare Minerals Matte Foundation Broad Spectrum SPF 15 ($27) for great coverage but a lightweight feel. Waterproof Mascara: Opting for a waterproof mascara is a must when going into the water. Covergirl’s LashBlast Waterproof Mascara ($8) comes in three shades that can be used for a more natural or intense look. Sweep two coats on in the morning and it should last all day. 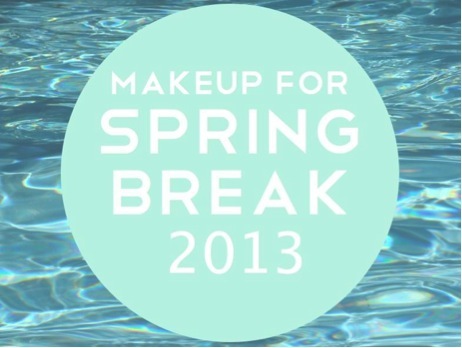 Waterproof Cream Shadow: To take this beachy look into night be sure to pack a waterproof cream shadow. Amazonian Clay Waterproof Cream Eyeshadows ($20) come in five colors that will add a little sparkle to the eyes. Use a moss, bronze or slate color for a natural look or the plum or seashell for a fun pop of color! Chapstick: Keeping lips moisturized is just as important as moisturizing skin. And make sure there is SPF in the chapstick to protect your lips. Try Kiss My Face’s Organic Lip Balm SPF 15 ($2). It has a coconut and pineapple scent and flavor, which will get you in the tropical mood as soon as you swipe this on your lips. Be sure to keep hydrated when playing in the sun and sand by drinking lots of water. And don’t forget to bring sunglasses, a towel and a tote bag for exploring or just lounging at the beach!